Beginning March 23, you can own The African Queen on DVD. 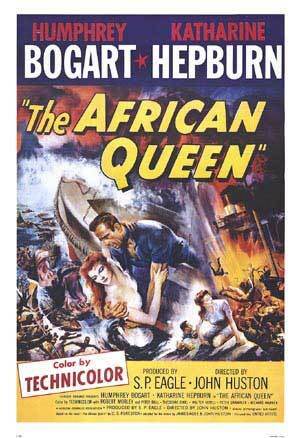 The 1951 classic starring Humphrey Bogart and Katharine Hepburn has never been released on DVD until now. So why the wait? Paramount took six years to restore the film using 4k digital technology. Jack Cardiff, the film’s cinematographer who passed away in April 2009, provided his commentary of the film for Paramount. Other special features include a new documentary, Embracing Chaos: Making The African Queen, about the making of The African Queen. Martin Scorsese is one of the film experts interviewed for the documentary. Limited editions will also include: an audio disc with a recording of a radio version of The African Queen; a Senitype film frame collectible reproduction; collectible postcards; and a reproduction of Hepburn’s out-of-print memoir, The Making of The African Queen or How I Went to Africa with Bogart, Bacall and Huston and Almost Lost My Mind. Now this is something that should make every film geek go nuts.